The goal of this article is to provide an understanding of the relative indications for several reconstructive options. Detailed discussions of proper surgical techniques are beyond the scope of this work. The surgeon should assess the need for a reconstructive procedure after adequate tumor removal. Reconstructive procedures are typically offered when the wound is deemed unsuitable for secondary intention healing. Even on a delicate nose, secondary intention healing can result in aesthetically acceptable results when the wound is small and shallow. Areas of the nose that heal well by secondary intention include the concavity of the nasal root in the area of the medial canthus and the concavity of the alar groove. Secondary healing typically produces acceptable results when the wound is less than 1 cm in diameter, less than 4-5 mm in depth, and greater than 5-6 mm in distance from the mobile alar margin. A reconstructive procedure should be considered if these wound criteria are not satisfied. Reconstructive procedures have the opportunity to increase the speed of healing, to prevent disastrous wound contraction that produces functionally significant deformity, and to produce aesthetically optimal results. Nasal reconstruction methods have few contraindications. If the patient tolerates tumor extirpation well, a nasal reconstructive procedure will likely be tolerated. Care should be exercised when previous surgical procedures or radiation therapy have altered the nose, because perfusion of nasal tissues then becomes highly unpredictable. Care should also be exercised in patients who use tobacco heavily; however, the influence of cigarette smoking on the survival of small nasal flaps is likely limited, unless tobacco use is extreme. Other medical conditions that may have a negative impact on the success of nasal reconstruction (as with any surgical procedure) include bleeding diatheses, chronic malnutrition, underlying severe disease/general debility, and unrealistic patient expectations. The anatomy of the nose is complicated because of the intricate arrangement of shadowing concavities and light-reflecting convexities. The surgeon should be aware of both the topographic anatomy and the internal anatomy of the nose before proceeding with any nasal reconstructive procedure. A review of nasal topography should be undertaken, and the surgeon should be acquainted with the concept of facial aesthetic units. Most dermatologic surgeons are confronted with small- to medium–sized nasal wounds; therefore, the concept of nasal skin types (as espoused by Dr. Gary Burget) is perhaps more relevant than the concept of nasal aesthetic subunits. In brief, this concept states that the nose has areas of thin, loose, and compliant skin. These largely forgiving areas are typically located on the nasal dorsum and sidewalls. After a transition zone, the nasal skin of the supratip, the tip, the infratip lobule, and the alae becomes thick, sebaceous, noncompliant, and unforgiving. The differences in skin types can be appreciated with an examining hand, and an accurate assessment of nasal skin types and transition zones is critical to the aesthetic success of any nasal reconstructive procedure. For the dermatologic surgeon, the internal anatomy of the nose is also relevant to surgical success. Nasal musculature is not terribly important for functional purposes; however, this musculature can dilate the nares in times of extreme inspiratory need, and it can serve a purpose in defining the nasal valve mechanism. More importantly perhaps, the nasal musculature provides a luxurious source of perfusion for random pattern cutaneous flaps. Fortunately, the arterial supply of nasal skin is redundant. The nose has an arterial supply from both the external carotid system (facial/angular artery) and the internal carotid system (ophthalmic artery branches in the area of the medial canthus). The underlying cartilaginous framework of the nose should also be reviewed before initiating any reconstructive procedure. This review has particular importance in the area of the middle/lateral nasal alae, as cartilaginous bolsters do not support potentially mobile alar margins. The lateral nasal alae can frequently be deformed during surgical reconstructive procedures that place even modest wound-closure tensions in directions that are not exactly parallel to the alar margins. Most of the procedures described in this article can be safely performed with the patient under simple local anesthesia. Lidocaine with epinephrine is used for anesthesia because of its excellent safety profile. Fifteen minutes before the initiation of the surgical repair, the local anesthetic is infiltrated into the soft tissues of the nose. Occasionally, appropriate nerve blocks can also be used for more complete and longer lasting anesthesia. To prevent infections resulting from flap or graft repair of the nose, some authors routinely use empiric antibiotics designed to cover staphylococcal organisms. Techniques to minimize the risk (which should be 5% or less) of partial or total flap loss include proper flap design, wide undermining to minimize wound-closure tension, meticulous hemostasis, delicate handling of tissue, and strict preservation of a highly vascular muscular flap base. Surgical attention should be directed toward the delicate handling of tissue and properly everting buried sutures, because incision lines on the nasal tip and alae are more visible than incision lines placed elsewhere on less sebaceous skin. Any flap should be carefully sized in both the horizontal dimension and the vertical dimension, because a large flap stuffed into a small hole has a high likelihood of developing a trapdoor deformity in the postoperative period. Wide undermining of the flap's recipient site has also been recommended as a helpful means of preventing a trapdoor deformity. Because nearly all of these nasal reconstructive procedures are performed in an outpatient setting under local anesthesia, a barrage of preoperative laboratory testing is rarely (if ever) indicated. If the patient's history or examination findings indicate a bleeding tendency, determinations of an intact hemostatic system can be obtained with a platelet count, bleeding time, and prothrombin time/activated partial thromboplastin time (PT/aPTT). Other laboratory investigations serve little purpose. Before considering nasal reconstruction, the first step in any surgical procedure for skin cancer occurring on the nose is to ensure adequate tumor removal. The Mohs micrographic surgical technique has been documented to have unparalleled success in the treatment of nonmelanoma skin cancer of the nose. On the nose, subclinical tumor extension is often dramatic, and this extension can make excision with traditional surgical margins inadequate. The Mohs technique allows accurate identification of clinically inapparent tumor spread, because the technique is a systematic examination of all lateral and deep surgical margins (see the images below). An apparently small recurrent basal cell carcinoma on the lateral ala (same patient as in following photo). Extensive subclinical tumor extension is identified following excision by using the Mohs micrographic surgical technique (same patient as in previous image). If access to Mohs micrographic surgery is not possible, every effort should be made to document the adequacy of surgical excision before contemplating reconstructive procedures. Before beginning any reconstructive procedure, the physician should adequately assess the surgical wound that has resulted from tumor extirpation. Particular attention should be directed toward determining the breadth, depth, and anatomic location of the wound, because these factors have a dramatic influence on the selection of the most appropriate reconstructive technique. The quantity and quality of tissue surrounding the wound should also be noted. Importantly, the surgeon should attempt to locate areas of adjacent tissue that share similar characteristics of skin color, sebaceous density, texture, and porosity with nasal skin. 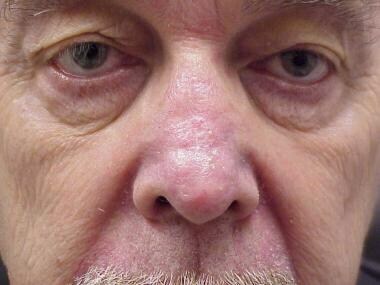 The presence of old surgical scars and radiation therapy stigmata should be identified on the nose, because these factors may predict inadequate cutaneous perfusion of adjacent tissue. A careful, prospective examination of the nose must also determine any functional deficiencies before the initiation of a reconstructive procedure. Failure to correct functional problems before covering the nasal wound with a flap or a graft may produce problems that are difficult to surgically correct later. The surgeon should evaluate the symmetry of the alar margins before beginning any reconstructive procedure. Although some minor degree of alar asymmetry is common, the patient may not have recognized this before the surgical procedure. With the increased visual attention placed on the nose during the postoperative period, the patient may inappropriately blame the surgeon for slight degrees of asymmetry. Following the determination of adequate tumor excision, the surgeon can begin to contemplate a nasal reconstructive procedure. A thorough understanding of nasal anatomy is a prerequisite before initiating any surgical procedure (see Relevant Anatomy). The surgeon should also consider the concept of nasal aesthetic subunits when assessing the degree of skin and soft-tissue loss. If the final aesthetic result can be improved, the surgeon should occasionally consider extending the existing surgical defect to the margins of the adjacent nasal aesthetic subunits. 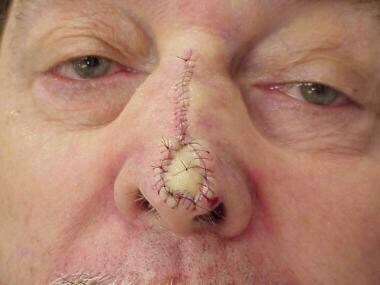 If the required wound repair procedure is beyond the abilities of the physician who excised the tumor, help from more qualified colleagues should be considered, because poor surgical reconstructions of the nose produce aesthetic and functional problems that can be difficult to correct later. In selecting a nasal reconstructive procedure, the surgeon understandably should select the surgical procedure that has the lowest morbidity while offering the highest likelihood of functional and aesthetic success. Small wounds may heal adequately with secondary intention healing. Other reconstructive options for the nose include linear closures, split-thickness skin grafts, full-thickness skin grafts, random pattern cutaneous flaps, and axial pattern cutaneous flaps. All of the approaches have predictable advantages and disadvantages. The goal of this article is to provide an understanding of the relative indications for several reconstructive options. Detailed discussions of proper surgical techniques are beyond the scope of this work. 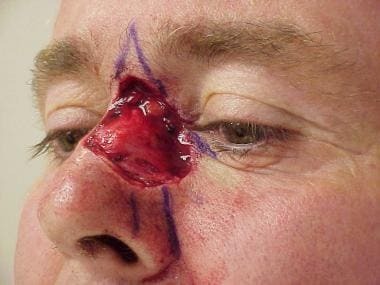 Small wounds on the nose can often be repaired in a simple linear (side-to-side) manner, which is often advantageous, because the complexity of the operative procedure is low; therefore, the patient's morbidity is diminished. The linear closure produces a predictably simple scar that is often aesthetically ideal. Unfortunately, many areas of the nose are not suitable for linear repairs because of the unavailability of mobile tissue, particularly in areas of the nasal tip and the alae. Therefore, linear repairs are often limited to areas of the lateral nasal sidewalls and the central nasal dorsum. Tissue redundancies (dog ears) on the nose are permanent and visually distracting; therefore, their creation should carefully be avoided. In the area of the upper lateral nasal sidewall, linear closures should be oriented to point toward the medial canthus, following the relaxed skin tension lines in that area. Nasal soft-tissue wounds on the central dorsum, the nasal supratip, and the nasal tip can also be considered for linear repair when they are small (ie, < 1 cm in diameter). A surgical ellipse created around these circular wounds should extend to a length-to-width ratio of at least 4:1, eliminating the potential for a distracting dog-ear deformity (see the following image). The distal part of the nose does not have any identifiable relaxed skin tension lines; therefore, closures in this area should be oriented vertically to prevent alar asymmetry. As with all linear closures on the nose, the tissue should be undermined at the level of the perichondrium. 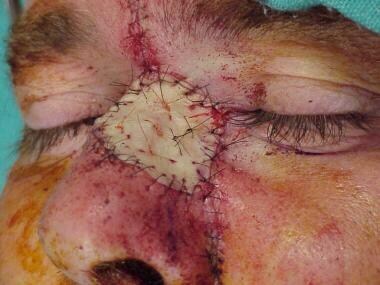 The wound is approximated by using buried vertical mattress sutures following meticulous hemostasis. Particular attention is paid to wound-edge eversion on the sebaceous areas of the nose, because surgical scars tend to invert in thickly skinned areas. A central nasal defect of approximately 1 cm. Note that the location of the wound is in the nasal midline (same patient as in following images). Although the linear closure on the nasal tip can be satisfying (see the images below), it unfortunately is only available for small wounds (< 1 cm). Larger linear closures on the nasal tip produce unacceptably high wound-closure tension, which promotes wound-edge ischemia and more visible scarring in the nasal tip area. 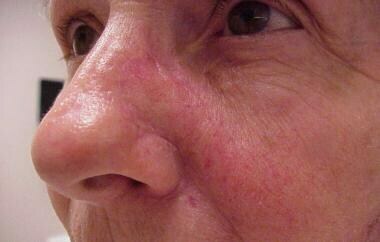 [5, 6] Such higher wound-closure tensions also produce an artificially flared appearance to the nasal ala. Linear closure on the nasal tip. Because the diameter of the defect is small, wound-closure tension (and therefore alar distortion) is minimal. Linear closure on the nose 8 weeks postoperatively. Note the acceptable cicatrix and the minimal alar elevation. An interesting variant of the linear closure for wounds located off-center in the area of the supratip is the Burow-type advancement flap, which can serve to close smaller wounds while maintaining alar symmetry (see the following images). An off-center wound near the nasal supratip. A Burow flap has been used to place the inferior dog-ear excision exactly in the nasal midline. 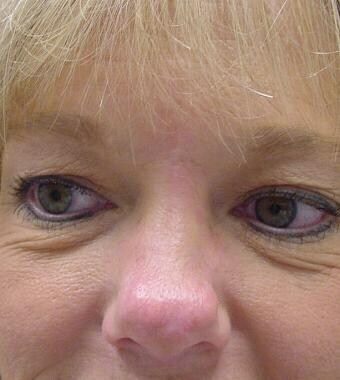 Split-thickness skin grafting can occasionally be considered in the repair of nasal wounds, such as covering large wounds on the nose; however, the aesthetic success of the grafts is often compromised by the propensity of the graft to significantly contract and to develop unsightly hyperpigmentation. More aesthetically appropriate alternatives are almost always available. Because the graft offers little hope for aesthetic success, split-thickness skin grafts should be considered to provide only biologic/functional coverage of the nasal wound. Therefore, split-thickness skin grafting plays a role in nasal reconstruction only in the patient who cannot tolerate surgery or in the case of a particularly virulent neoplasm when a more involved reconstruction is delayed to observe the potential of the tumor's persistence. In nasal reconstruction, full-thickness skin grafting is typically a better aesthetic option than split-thickness skin grafting. Full-thickness skin grafts contract much less than split-thickness skin grafts, thereby minimizing the risk of aesthetically significant alar distortion. Full-thickness skin grafts typically retain a more natural color, and they can often maintain textural characteristics (eg, visible pores) that reflect the quality of donor sites. These skin grafts are an important nasal reconstructive modality, but some surgeons believe that well-designed and executed random pattern cutaneous flaps often exceed full-thickness skin grafts in the final aesthetic results. Therefore, such surgeons rely on full-thickness skin grafting as a repair technique in only 20-30% of nasal wounds encountered. Some authors select full-thickness skin grafting as a reconstructive modality when secondary intention healing, linear repairs, and uncomplicated flap repairs are not suitable. Typically, full-thickness skin grafting is selected for large wounds of the nose (see the images below). The author believes that full-thickness skin grafting has an important role in the reconstruction of the nasal tip and the ala, because flaps moved into these areas can cause tremendous nasal distortion if not carefully designed and executed. Full-thickness skin grafts are most appropriate in reconstructing shallow nasal wounds. Because full-thickness skin grafts need to be thinned before grafting, the grafts should be relied on to provide only minimal soft-tissue replenishment. Complex skin and soft tissue defect on the nasal dorsum and sidewalls (same patient as in following images). Glabellar and cheek components of the wound have been closed with local tissue advancement. As a result of its shallow nature and location on nonsebaceous skin, the larger nasal portion of the wound has been covered with a full-thickness skin graft. The early result (8 wk) of the repair is acceptable. The slight amount of hyperpigmentation of the skin graft will likely resolve without further surgical intervention. Although full-thickness skin grafts are visually most appropriate when used in the nasal sidewall areas, some surgeons find that the sidewall areas are often more easily reconstructed with other surgical techniques. Therefore, these authors largely limit the use of skin grafts to areas of the nasal tip and the alae. After a graft has been harvested from an appropriate donor area, the skin graft is attached to the recipient site by using nonabsorbable sutures. The suturing technique is performed such that the skin graft is adequately anchored to the recipient bed, producing a visible concavity of the skin graft at the conclusion of the procedure. Central basting sutures are loosely tied in the skin graft to prevent lateral traction on the graft. If the sutures are tied too tightly, the resulting pleats of the graft become permanent. Some authors believe that the use of bolster sutures is not necessary. Sutures should be removed within 1 week. 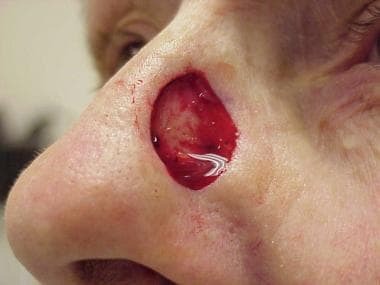 A Burow skin graft is a technique in which the most superior portion of the nasal wound is closed in a linear manner, and the dog-ear redundancy is donated to the nasal tip wound as a full-thickness skin graft (see the images below). Predictably, the Burow repair has advantages and disadvantages similar to both linear closures and full-thickness skin grafts on the nose. Of particular value is the ability of the Burow graft to diminish the size of the skin graft on the nasal tip. Some surgeons believe this dramatically minimizes the cosmetic visibility of the grafts. When designing a Burow graft repair of the nose, the surgeon should pay particular attention to determining the degree of skin mobility over the nasal dorsum. To prevent the production of distracting alar asymmetry, the vertical component of the repair should be oriented near the midline. A central nasal defect that extended to the perichondrium. The patient was not interested in pedicled flap repair (same patient as in the following images). A Burow graft repair diminished the size of the required graft and harvested suitable tissue from the more proximal nasal dorsum. The final aesthetic result is acceptable to the patient. Note the only slight visibility of the graft. A redundancy immediately superior to the existing surgical defect is excised, and the tissue is placed on sterile gauze soaked in sodium chloride solution. The nasal soft tissue is then bluntly undermined at the level of the perichondrium and the periosteum. The superior part of the wound is closed in a layered fashion. Some surgeons carry the layered closure distally toward the nasal tip, until the lateral aspects of the nasal alae begin to lift. At that time, the excised redundancy is donated to the remaining wound as a full-thickness skin graft (see the second image above). 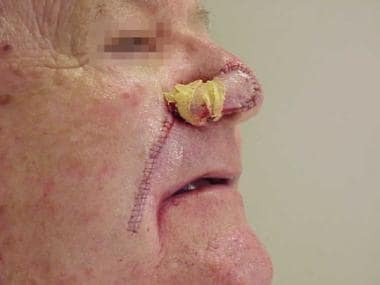 The skin graft appears to do particularly well, because the skin from the superior aspect of the nasal dorsum is similar in color, quality, and texture to the missing nasal tip skin (see the last image above). Despite vigorous undermining around the graft recipient site, graft loss is typically not a problem with this reconstructive modality. Burow grafts offer reconstructive success in patients who are intolerant to more involved pedicled flap repairs. 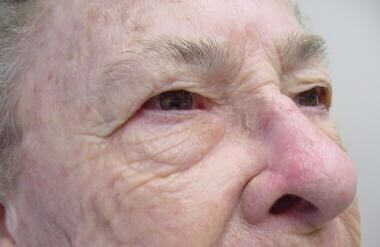 Random and axial pattern cutaneous flaps are particularly important in nasal reconstruction. 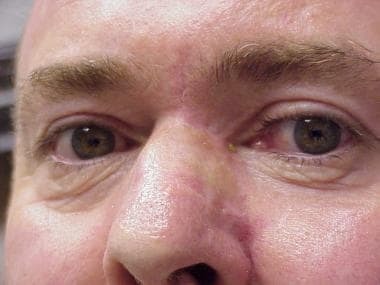 Cutaneous flaps offer the surgeon the ability to replace missing nasal tissue with tissue of a similar color, texture, and porosity. These flaps are often 1-step procedures, and the aesthetic results typically exceed those of secondary intention healing and full-thickness skin grafting when appropriate surgical design and technique are used. With experience, flap reconstructions of the nose are predictable; however, the procedure has several disadvantages. Because significant undermining is associated with flap reconstructions on the nose, the patient's morbidity may be increased. 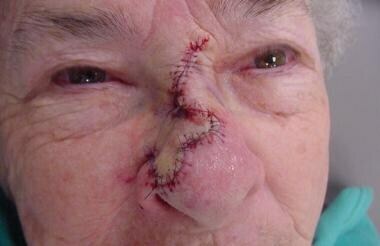 Additional incision lines on the central part of the face need to be made to create cutaneous flaps. The aesthetic outcome can be disastrous in the absence of surgical expertise. If the surgeon lacks a complete understanding of flap biomechanics, flap necrosis and nasal distortion can occur. Necrosis is particularly an unfortunate complication, because it introduces a larger surgical defect on the nose. Nonetheless, with proper experience, flap repairs of the nose offer significant advantages. Therefore, flaps constitute a large percentage of nasal reconstructive procedures performed by some surgeons. Although a full discussion of the various flaps relevant in nasal reconstruction is beyond the scope of this article, a few general comments are appropriate regarding the flap techniques that are more commonly used. In selecting a flap with which to perform reconstruction, the surgeon should pay particular attention to tissue availability on the nose. The skin of the nasal tip and the ala is sebaceous, noncompliant, and thick; therefore, flaps raised within this skin can commonly cause permanent iatrogenic asymmetry of the distal part of the nose. Particularly in men with sebaceous/rhinophymatous skin, the performance of flap surgery on the distal part of the nose can be problematic. The surgeon should also assess the architectural stability of the lateral nasal ala before any flap repair on the distal part of the nose is performed. If the lateral ala is unsupported, additional flap bulk moved into this area will likely cause alar collapse and permanent functional compromise. The primary advantage of a rhombic transposition flap is the ability to move tissue from an area in which it is more readily available to an anatomic area that lacks sufficient tissue availability. The rhombic flap also reorients wound-closure tension vectors, which can be particularly important in minimizing alar distortion. Although rhombic flaps are frequently used on the nasal tip, some surgeons tend to avoid them in this area because of their tendency to produce unattractive nasal tip and alar distortion. Most of the rhombic transposition flaps that some surgeons use on the nose are located along the lateral nasal sidewall and the glabellar areas. These flaps can donate more proximal nasal skin to distal areas that lack sufficient tissue availability. Rhombic transposition flaps can minimize the addition of incision lines to sebaceous distal nasal skin. Although a multitude of rhombic flap designs are available to the surgeon, some authors prefers a modified Dufourmentel design (see the images below). This design allows easy closure of a circular wound while minimizing any dog-ear redundancies at the origin of the flap. A small Mohs defect on the nasal sidewall (same patient as in the following images). A rhombic flap is used to donate more available proximal nasal skin into the surgical defect. At 8 weeks, the aesthetic result from the repair is excellent. The bilobed flap offers the ability to replace missing skin on the distal aspect of the nose with skin of a similar quality obtained from more proximally located nasal areas. When designed and executed properly, the bilobed flap almost always excels in reconstructing the distal part of the nose (see the images below). 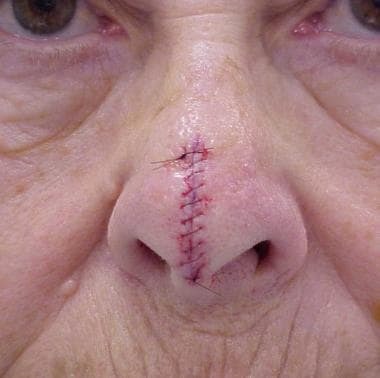 A surgical defect of approximately 1.5 cm on a sebaceous distal part of the nose (same patient as in the following images). The wound is reconstructed with a bilobed transposition flap. The distal part of the nose is not distorted because the flap is properly designed. 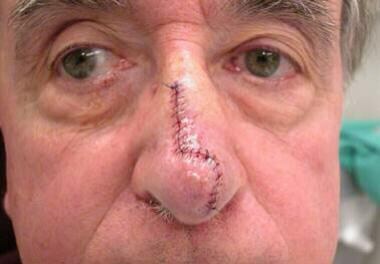 At 8 weeks after flap repair, the nose has healed nicely without additional intervention. The surgeon should prospectively determine the amount and the direction of tissue availability to minimize distortion of the nose. A proper flap design should then be selected. The Zitelli modification offers distinct advantages over the traditional Esser flap design touted in many plastic surgery textbooks. The flap should be appropriately sized to prevent secondary motion at the recipient sites of the flap. To minimize distortion, both the primary lobe and the secondary lobe of the flap should be equally sized to the recipient sites. When possible, the donor site of the secondary lobe should be placed perpendicular to the alar margin to prevent unanticipated alar elevation. Once the design factors have been considered appropriately, the flap should be definitively incised. The incision should be carried to the depth of the perichondrium or the periosteum. Wide undermining is critical in properly executing the bilobed flap, because it dramatically improves the mobility of the flap, minimizes the likelihood of nasal distortion, and diminishes the likelihood of the flap undergoing pincushioning. As a result of the undermining being performed at the level of the perichondrium or the periosteum, the nasal musculature, replete with highly anastomotic blood vessels, is included in the flap's base. Hemostasis is achieved, and the flap is transposed to fill the primary and secondary surgical defects. Due to the dog-ear redundancy being prospectively removed at the edge of the primary defect, the flap is easily transposed to fill the surgical defect. To minimize the likelihood of alar displacement, the tertiary defect is closed initially. Buried vertical mattress sutures are used, and the retracted muscle is again reapproximated to diminish the appearance of the incision lines. After the tertiary defect is closed, the primary and secondary lobes of the flap are subsequently positioned. Vertical mattress buried sutures are used to align the flap, and the epidermal closure can then be performed rapidly with a running suture. Intraoperative flap modifications should be performed if alar displacement is identified. Undermining the inferior margin of the primary defects along the alar rim is among the most useful of the modifications. The dorsal nasal flap offers particular advantages for reconstructing nasal surgical wounds that are greater than 1.5 cm in diameter. When properly designed and executed, the dorsal nasal flap excels in the repair of large distal nasal defects. Similar to the bilobed transposition flap, the dorsal nasal flap offers the ability to replace missing nasal tissue with tissue of a similar color and texture; however, the dorsal nasal flap is a much more involved reconstructive procedure than that of the bilobed transposition flap. Incision lines are long, and the aesthetic result can be undesirable if expert technique is not used. More importantly, dramatic distortion of the nose is likely if proper modifications of the flap are not undertaken. If modifications are not appropriately designed, the vascular input of the flap can become precarious. If the blood supply is compromised, a necrotic flap on the nose produces a greatly enlarged surgical defect. The dorsal nasal rotation flap demonstrates many of the nuances of rotation flap reconstruction of the face. Care should be taken to elongate the arc of the rotation flap so that the secondary defect created when the flap is moved is narrow at any one point. This maneuver minimizes the likelihood of distortion of the alar margin or the medial canthus. Equally important in the design of the dorsal nasal flap is extension of the leading edge along the primary defect, which is distinct from a traditional rotation flap design. The modification minimizes the influence of pivotal restraint on the flap. The mobility of the flap is dramatically enhanced, with a significant back cut in the area of the glabella. The back cut can be extended to the area of the medial canthus, and it produces a flap that is mobile because of a narrow pedicle. After the flap has been incised, the entire nasal surface should be undermined at the level of the periosteum or the perichondrium. Particular attention should be paid toward gently undermining the area of the medial canthus, because the vascular supply of the flap originates in this area. With the appropriate flap design and undermining, the flap can be easily rotated to fill the primary defect under minimal tension. Alar distortion is not produced, because the tension is minimized and the perfusion of the flap is ensured (see the images below). A large surgical wound on the nasal tip. The patient desired a 1-step surgical reconstruction (same patient as in the following images). A dorsal nasal rotation flap was used to repair this distal defect. At 3 months, the flap has provided an aesthetic appearance that exceeds the typical appearance of a graft repair. The nasolabial transposition flap is a 1-step transposition/advancement flap that is useful in the reconstruction of lateral alar defects. The flap is advantageous, because it offers a 1-step repair of the lateral ala. Its donor site is skillfully hidden in the melolabial crease; however, the nasolabial transposition flap has several distinct disadvantages. The flap is capable of anatomic distortion if it is not widely undermined. The alar groove is necessarily blunted, and the flap is particularly prone to development of a trapdoor deformity. Some authors select nasolabial flaps when a surgical defect is located on the lateral ala or in the area of the alar groove. The incision line of the flap is made directly into the melolabial fold. The flap undergoes predictable shortening as it transposes (illustrating pivotal restraint); therefore, the flap should be elongated at its donor site on the medial cheek. Dog ears in the area of the melolabial fold and immediately superior to the surgical defect on the nose are removed generously. This maneuver minimizes the risk of developing unsightly tissue protuberances in the postoperative period. After the flap is incised, it is widely undermined in the area of the central part of the cheek. Hemostasis is achieved, and adequate flap mobility is ensured before suturing. The placement of deep tacking sutures is of particular importance in creating the nasolabial transposition flap. After sufficient flap mobility has been achieved with wide undermining, a deep suture is placed in the piriform aperture area in the region of the alar base. This suture serves to anchor the flap in the nasofacial sulcus area and the nasolabial fold area. Additional tacking sutures are placed from the recipient bed along the lateral nasal sidewall into the flap, but tacking sutures need to be carefully placed in this area to minimize the risk of inducing flap ischemia. When the primary lobe of the flap is placed into the surgical defect, care is taken not to oversize the flap. Over sizing dramatically increases the risk of developing a trapdoor deformity. The entire nasolabial flap is carefully anchored with buried sutures, and the epidermal closure is achieved with a running stitch. To restore the alar groove, a secondary procedure can be performed at a later date to improve the final aesthetic outcome of the repair. An interesting variant of the nasolabial flap is the turn-over flap, initially described by Spear et al. This nasolabial flap is flipped upon itself so that the skin of the medial cheek's donor site serves as both the internal nasal lining and the external nasal coverage. By repairing full-thickness wounds of the lateral ala in a single operative procedure, this flap makes an attractive alternative to the traditional staged repairs used for difficult full-thickness wounds in this area. The island pedicle flap is a V-Y advancement flap that is useful in the closure of deep surgical defects located in the lateral nasal sidewall area and in the closure of smaller wounds located in the nasal tip area. [19, 20] The base of the flap has predictably luxurious vascular input; therefore, a thick, easily mobile flap can be generated. When the flaps are used to reconstruct nasal wounds, attention should be directed toward the tapering area of the flap. If the flap tapers too rapidly, the secondary motion at the flap's donor site produces distracting vertical alar displacement. Although the incision lines of the island pedicle flap can appear complicated, they are usually easily camouflaged within the naturally occurring anatomic landmarks if expert surgical technique is used. The island pedicle flap has a thick muscular base; therefore, the flap is predisposed to developing a pincushion deformity. To minimize the risk of developing this complication, some surgeons typically suture the flap carefully so that a central flap concavity is produced at the termination of the procedure. 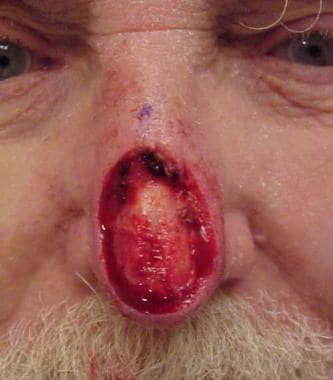 These physicians routinely use the island pedicle flap to close deep surgical wounds of the lateral sidewall or the nasal tip, particularly if mobile proximal nasal skin is not available (see the images below). A deep surgical wound on the lateral nasal sidewall. 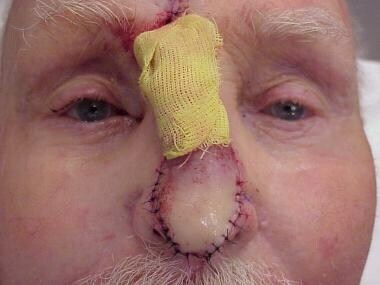 Insufficient tissue is available on the proximal nose to harvest a flap that will cover the wound (same patient as in the following images). To adequately replace the volume of tissue that has been surgically removed, an island pedicle flap is used to repair this nasal wound. Note that the flap does not taper until the most lateral ala. Also note the deep flap concavity that minimizes the visibility of postoperative pincushioning. Final aesthetic result of the island pedicle flap repair. Note the excellent restoration of the nasal contour. When the surgical defect is located closer to the nasal tip, reconstruction of the defect with a 1-step nasolabial transposition flap is not easily accomplished. Additionally, if the surgical wound on the distal nose is too large for a bilobed transposition flap or is not well suited for a dorsal nasal rotation flap, a pedicled flap can be considered. Pedicled flaps offer distinct advantages in the reconstruction of the distal part of the nose. Surgical predictability is the primary advantage of pedicled flap reconstructions. 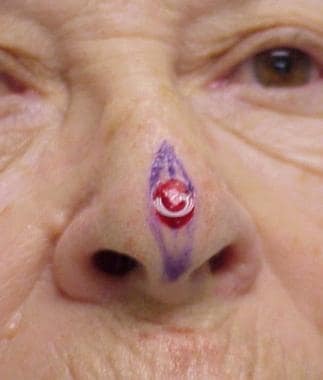 The perfusion of the flaps is predictable because of their pedicled nature, and the flaps can be thinned appropriately to match the contour of the nasal tip. The disadvantages of pedicled flaps include the introduction of significant scarring at the donor site and the necessity to do at least 2 surgical procedures (creation and separation/insertion of the flap). The pedicled nasolabial flap (see the images below) is often advantageous, because the donor's morbidity is considerably lower than that associated with the paramedian forehead flap. The donor scar is placed within the melolabial fold, rendering it nearly imperceptible. An appropriate donor site is selected within the melolabial fold area of the medial part of the cheek. The flap design is analogous to that of a 1-step nasolabial transposition flap (see Nasolabial Transposition Flap). As the flap is undermined, it is aggressively thinned at its tip to the level of the dermis. At the pedicled flap's origin area on the lateral part of the nose, undermining is carried much more deeply. This maneuver produces a highly vascular and thick muscular pedicle that ensures flap viability. 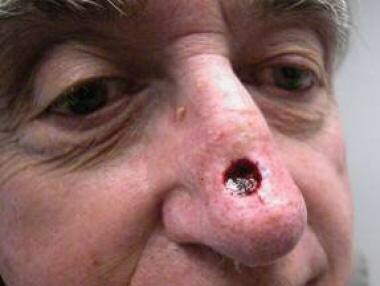 A nasal tip wound located medially (same patient as in the following images). A pedicled flap has been used to reach this distant surgical defect. The donor morbidity of this pedicled nasolabial flap was predicted to be lower than the morbidity associated with a paramedian forehead flap. The pedicle will remain intact for approximately 3 weeks. 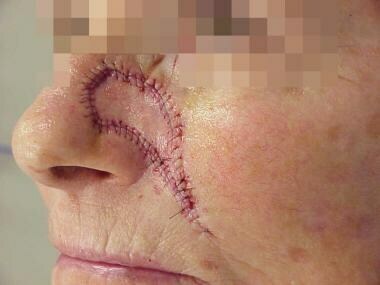 Final surgical result after separation of the flap. Note the effective restoration of the nasal tip and the inapparent donor scar in the area of the medial cheek. A thorough understanding of pivotal restraint is vital if the flap is used to cover wounds on the nasal tip. The flap undergoes significant shortening; therefore, the donor site in the melolabial fold must be longer than typically anticipated. The donor site is sutured appropriately after wide undermining, and the flap tip is thinned and placed onto the nasal tip. At 3 weeks, the pedicle is severed and inserted into the area of the medial part of the cheek. Then, the flap can be lifted gently and thinned to an appropriate contour. Careful intraoperative observations of the fullness of the nasal tip should be performed during the flap-thinning procedure. The author often slightly thins the flap more during this second procedure because of the nearly universal development of some pincushioning with this flap. 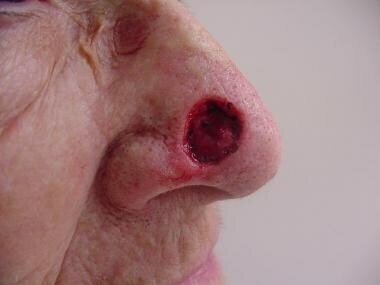 A large surgical wound of the nasal tip and supratip areas following Mohs surgery for a recurrent basal cell carcinoma (same patient as in the following images). The defect has been enlarged to match the nasal aesthetic subunits, and the wound has been covered with a paramedian forehead flap. The pallor of the flap is merely a reflection of the use of local anesthetic with epinephrine. Two months after separation and insertion of the forehead flap. The paramedian forehead flap is a 2-step procedure that is commonly and safely performed as an outpatient intervention. It provides excellent results in the reconstruction of the aesthetic subunits of the nose. [22, 23] The forehead has a large reservoir of donor tissue, and its skin has a close aesthetic match to the skin of the nasal tip. Therefore, the forehead flap offers unparalleled opportunities for successful nasal reconstruction; however, several distinct disadvantages are associated with the flap. This is a more involved surgical procedure; therefore, the patient's surgical morbidity is significantly increased. The procedure is a 2-step procedure, and the patient's desire to undergo a staged procedure should be prospectively assessed. The donor scar on the forehead is often inconspicuous, but the patient needs to be counseled regarding the visibility of the scar and the slight medial migration of the brows, which are inherent to the flap. 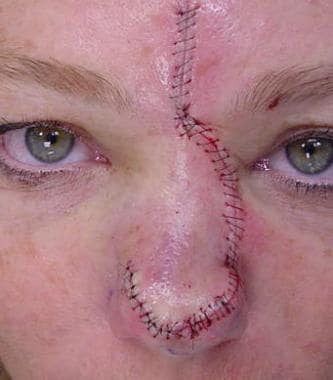 Some authors use the paramedian forehead flap to reconstruct large wounds on the distal part of the nose. If the wound encompasses greater than 60-70% of the nasal aesthetic subunits, these physicians consider enlarging the surgical defect to fit the normal aesthetic unit boundaries. A 3-dimensional template of the surgical defect is made by using a foil suture package. The template is transposed to the forehead, on which a careful outline is made. The supratrochlear artery can be located by using a Doppler ultrasonographic examination; however, its reliable positioning near the corrugator fold is almost always certain. The flap's pedicle is designed to have a width of 1.3-1.5 cm. The flap is raised from the forehead, and the vascular pedicle is protected during wide undermining. The supratrochlear artery typically lies between the frontalis and the corrugator musculature. Dissection of the flap's pedicle near the orbital rim should be carefully performed. The flap's donor site is closed in a linear fashion. Occasionally, the wound-closure tension on the forehead is so great that the entire wound cannot be closed in a linear manner. Some surgeons favor secondary healing of the remaining defect; these physicians believe skin grafts or local flaps are aesthetically inferior compared with secondary intention healing on the superior aspect of the forehead. The flap is transposed to cover the nasal defect, and it should be sewn under minimal- to no wound-closure tension to prevent anatomic distortion of the nose and to preserve the flap's vascular supply. The flap is separated and inserted at 3 weeks. At that time, the flap can also be appropriately thinned. Alternatively, the flap can also be aggressively thinned at this 3-week intervention, while keeping the axial, superior vascular input and the distal connection to the alar rim or tip intact. Several months after the initial procedure, a subsequent procedure can be performed to further thin the flap and to reintroduce the alar grooves, if required. Following the completion of the reconstructive procedure, liberal ointment (antibacterial ointment or bland petrolatum) is applied to the suture line. The wound is covered with a nonstick pad and a pressure dressing consisting of gauze and paper tape. Even the tightest pressure dressing is obviously no substitute for intraoperative hemostasis. The patient is instructed to clean the wound with sodium chloride solution and to reapply ointment 3 times a day for the entire time the sutures remain in place. The sutures are removed within 5-7 days. Longer suture retention promotes poor aesthetic results by causing visible suture tracks, particularly on the sebaceous nose. After suture removal, the patient is typically given instructions to follow up in 6-8 weeks to determine the need for additional intervention, which is uncommon. 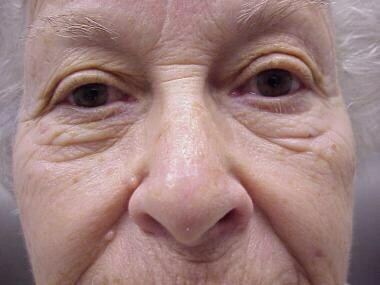 Flap contouring procedures and elective dermabrasion are occasionally required for revision techniques if the aesthetic results from initial efforts at reconstruction have been less than ideal. 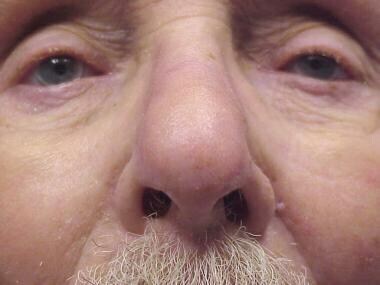 Nasal reconstructive procedures can be safe and effective with proper training, patient selection, surgical planning, and operative technique. Surprisingly, few complications are associated with properly designed and performed nasal reconstructive surgery. Risks, as with any surgical procedure, include operative site bleeding, hematoma formation, wound infection, and tissue necrosis. 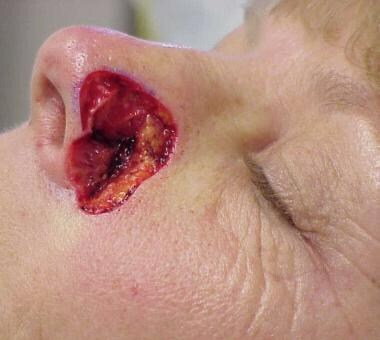 Although the risks of bleeding are always present, the incidence of hemorrhagic complications can be minimized with proper patient selection and surgical technique. 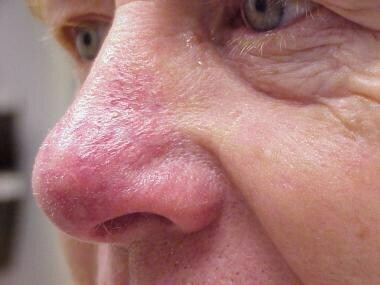 Wound infections on the nose are exceedingly uncommon. To prevent infections resulting from flap or graft repair of the nose, some surgeons routinely use empiric antibiotics designed to cover staphylococcal organisms. 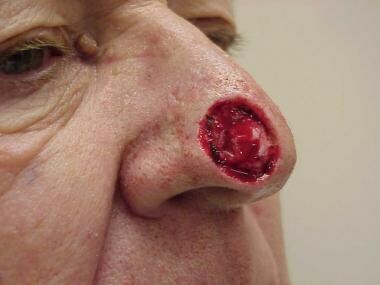 Because the nose has aesthetic prominence, tissue necrosis can have a disastrous impact on patients. Certainly, skin grafts have a higher risk of ischemia than skin flaps. If the recipient site of the graft is properly prepared, the incidence of skin graft loss is low. Total loss of the graft is uncommon. If partial or total graft loss occurs, the wound is allowed to heal by secondary intention, and a revision procedure is considered after complete healing has occurred. 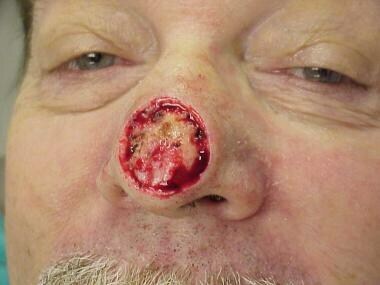 Flap necrosis on the nose is exceedingly uncommon in nonsmoking patients if proper understanding of flap dynamics is achieved. Techniques to minimize the risk (which should be 5% or less) of partial or total flap loss include proper flap design, wide undermining to minimize wound-closure tension, meticulous hemostasis, delicate handling of tissue, and strict preservation of a highly vascular muscular flap base. Few ischemic complications occur with nasal flaps; therefore, nasal flap technique often excels in reconstructing the nose. If a flap fails, revision procedures can be used after healing has occurred. Some surgical complications occur relatively more frequently on the nose. Certainly, any functional compromise of the alae should be addressed before the wound is covered with a flap or a graft. Distal nasal skin has a sebaceous nature, rendering the incision lines on the nasal tip and the alae more visible than incision lines placed elsewhere on less sebaceous skin; therefore, surgical attention should be directed toward the delicate handling of tissue and properly everting buried sutures. The development of the trapdoor deformity, that unsightly pincushioning of flaps and grafts, typically begins to appear at 3-6 weeks postsurgery, and the phenomenon appears to be more common on the nose than on other areas of the face. Therefore, any flap should be carefully sized in both the horizontal dimension and the vertical dimension, because a large flap stuffed into a small hole has a high likelihood of developing a trapdoor deformity in the postoperative period. Wide undermining of the flap's recipient site has also been recommended as a helpful means of preventing a trapdoor deformity. Care should also be exercised in patients who use tobacco heavily; however, the influence of cigarette smoking on the survival of small nasal flaps is likely limited, unless tobacco use is extreme. Other medical conditions that may have a negative impact on the success of nasal reconstruction (as with any surgical procedure) include bleeding diatheses, chronic malnutrition, underlying severe disease/general debility, and unrealistic patient expectations. Although some minor degree of alar asymmetry is common, the patient may not have recognized this before the surgical procedure. With the increased visual attention placed on the nose during the postoperative period, the patient may inappropriately blame the surgeon for slight degrees of asymmetry. Menick FJ. Nasal reconstruction. Plast Reconstr Surg. 2010 Apr. 125 (4):138e-150e. [Medline]. [Full Text]. Rowe DE, Carroll RJ, Day CL Jr. Mohs surgery is the treatment of choice for recurrent (previously treated) basal cell carcinoma. J Dermatol Surg Oncol. 1989 Apr. 15(4):424-31. [Medline]. Dzubow LM. Flap dynamics. J Dermatol Surg Oncol. 1991 Feb. 17(2):116-30. [Medline]. Cook J, Zitelli JA. Primary closure for midline defects of the nose: a simple approach for reconstruction. J Am Acad Dermatol. 2000 Sep. 43(3):508-10. [Medline]. Burget GC. Aesthetic reconstruction of the tip of the nose. Dermatol Surg. 1995 May. 21(5):419-29. [Medline]. Burget GC, Menick FJ. Repair of small surface defects. Aesthetic Reconstruction of the Nose. St. Louis, Mo: Mosby-Year Book; 1994. 117-56. Silapunt S, Peterson SR, Alam M, Goldberg LH. Clinical appearance of full-thickness skin grafts of the nose. Dermatol Surg. 2005 Feb. 31(2):177-83. [Medline]. Rohrer TE, Dzubow LM. Conchal bowl skin grafting in nasal tip reconstruction: clinical and histologic evaluation. J Am Acad Dermatol. 1995 Sep. 33(3):476-81. [Medline]. Tan E, Mortimer N, Salmon P. Full-thickness skin grafts for surgical defects of the nasal ala - a comprehensive review, approach and outcomes of 186 cases over 9 years. Br J Dermatol. 2014 May. 170 (5):1106-13. [Medline]. Lindsay KJ, Morton JD. Flap or graft: the best of both in nasal ala reconstruction. J Plast Reconstr Aesthet Surg. 2015 Oct. 68 (10):1352-7. [Medline]. Cook JL. A review of the bilobed flap's design with particular emphasis on the minimization of alar displacement. Dermatol Surg. 2000 Apr. 26(4):354-62. [Medline]. Cook JL. Reconstructive utility of the bilobed flap: lessons from flap successes and failures. Dermatol Surg. 2005 Aug. 31(8 Pt 2):1024-33. [Medline]. Zitelli JA, Moy RL. Buried vertical mattress suture. J Dermatol Surg Oncol. 1989 Jan. 15(1):17-9. [Medline]. Zitelli JA. The nasolabial flap as a single-stage procedure. Arch Dermatol. 1990 Nov. 126(11):1445-8. [Medline]. Spear SL, Kroll SS, Romm S. A new twist to the nasolabial flap for reconstruction of lateral alar defects. Plast Reconstr Surg. 1987 Jun. 79(6):915-20. [Medline]. Fosko SW, Dzubow LM. Nasal reconstruction with the cheek island pedicle flap. J Am Acad Dermatol. 1996 Oct. 35(4):580-7. [Medline]. Hairston BR, Nguyen TH. Innovations in the island pedicle flap for cutaneous facial reconstruction. Dermatol Surg. 2003 Apr. 29(4):378-85. [Medline]. Thorpe RB, Nijhawan RI, Srivastava D. The V-to-Y Advancement Flap for Distal Nasal Reconstruction: Our Experience With 39 Patients. J Cutan Med Surg. 2018 Jul/Aug. 22 (4):411-4. [Medline]. Menick FJ. A 10-year experience in nasal reconstruction with the three-stage forehead flap. Plast Reconstr Surg. 2002 May. 109(6):1839-55; discussion 1856-61. [Medline]. Menick FJ. Nasal reconstruction: forehead flap. Plast Reconstr Surg. 2004 May. 113(6):100E-11E. [Medline]. Menick FJ. Aesthetic refinements in use of forehead for nasal reconstruction: the paramedian forehead flap. Clin Plast Surg. 1990 Oct. 17(4):607-22. [Medline]. Zito PM, Mazzoni T. Flaps, Nasal Reconstruction, Paramedian Forehead. 2018 Jan. [Medline]. [Full Text]. Menick FJ. A new modified method for nasal lining: the Menick technique for folded lining. J Surg Oncol. 2006 Nov 1. 94(6):509-14. [Medline]. Fulco I, Miot S, Haug MD, et al. Engineered autologous cartilage tissue for nasal reconstruction after tumour resection: an observational first-in-human trial. Lancet. 2014 Jul 26. 384(9940):337-46. [Medline]. Jayarajan R. A Combination Flap for Nasal Defect Reconstruction. Ann Plast Surg. 2018 May 17. [Medline]. 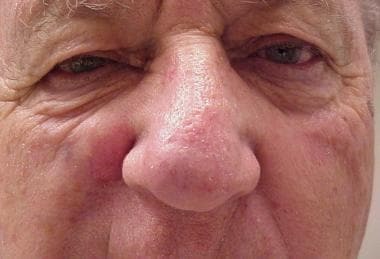 A Mohs surgical defect of the medial cheek and nose (same patient as in the following images). The wound has been repaired with medial advancement of the cheek and a full-thickness skin graft. The surgical result at 4 months. A recurrent basal cell carcinoma of the left ala.
A full-thickness alar defect has been produced upon tumor removal. A turn-over nasolabial flap, where the medial cheek skin serves as both nasal lining and external nasal coverage, is used to repair this wound in a single operative procedure. Note the temporary elevation of the ipsilateral upper lip. The 6-month lateral view of the well-healed flap. Oblique view of the reconstructed left ala.
A large nasal tip defect with the underlying cartilage intact. The wound has been extended to meet the aesthetic sub-unit boundaries, and the larger wound has been repaired with a paramedian forehead flap. Postoperative view at week 16. Note the well-hidden incision lines at the junctions of aesthetic units. A shallow wound along the nasal sidewall. An advancement flap from the medial cheek has been used to cover the wound. A well-healed flap at 4 months. Because the alar symmetry has been retained, the aesthetic results are pleasing. A multiply recurrent basal cell carcinoma with severe scarring and alar retraction. A complex nasal wound with missing skin, cartilage, and mucosal lining was produced upon tumor removal. A bipedicled flap was used to restore the missing nasal lining, a cartilage graft from the concha was used to restore the stiffness of the ala, and an overlying paramedian forehead flap was used for skin coverage. An aesthetically appropriate result for a very complicated nasal wound. The photograph represents a pedicled nasolabial flap because the flap originates from the nasolabial (or melolabial) fold and a thick muscular pedicle remains attached. The photograph depicts a traditional nasolabial transposition flap. Disclosure: Received honoraria from Ethicon for consulting.